Catholics and Methodists share a foundational belief in Jesus Christ. The Catholic Church and the United Methodist Church are Christian churches. Both believe in a triune God, which means three persons -- the Father, the Son and the Holy Spirit -- in one God, although sometimes the Methodist Church uses the gender-neutral language of creator, redeemer and sustainer. Both churches believe Jesus was human as well as divine, and that people are saved through faith in him; both churches teach that non-Christian people can also be saved. Both churches stress the importance of helping those in need, regardless of their religious affiliation. While these two branches of Christianity share some core beliefs, they also have significant differences. 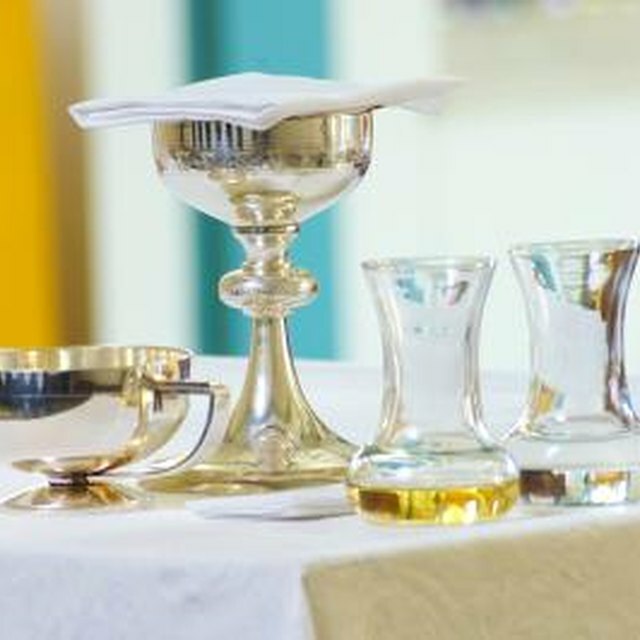 Like most Protestant churches, the Methodist church celebrates two sacraments, baptism and communion. Methodists commonly refer to communion as the "Lord's Supper." They teach that communion is "a holy meal of bread and wine that symbolizes the body and blood of Christ." 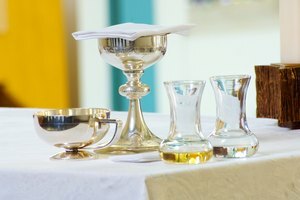 For Methodists, communion is the time to remember the life, death and resurrection of Jesus; to experience gratitude for Christ and unity with other believers; and to be strengthened to go out and serve others. Methodists allow any believers who choose to join in communion. Baptism in the Methodist church signifies new life in Christ and a joining with other believers. Methodists baptize people of any age with water by sprinkling, pouring or immersing them. Catholics believe communion, generally called the Eucharist, is "the real presence of Jesus, who died for our sins." Communion brings believers closer to God and provides spiritual nourishment. Only Catholics in good standing are to receive communion in the Catholic church. Baptism is "the Church's way of celebrating and enacting the embrace of God." Generally, infants are baptized by sprinkling. 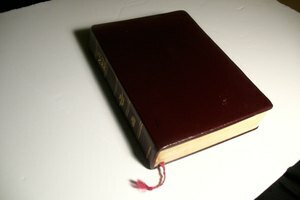 The Catholic church has seven sacraments: The others are Confirmation, where young people make a commitment to the church; Reconciliation, when people confess their sins to a priest and receive absolution; Marriage, also known as Holy Matrimony; Holy Orders, where the bishop ordains new priests; and Anointing of the Sick. Essentially, the structure of the Methodist church is representative, and the structure of the Catholic church is hierarchical. 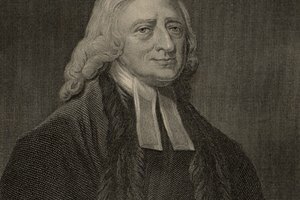 There is no head of the Methodist church; the General Conference establishes policy and speaks for the church. 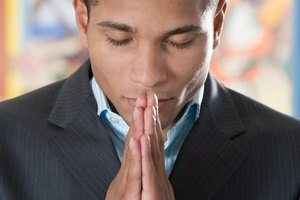 Half of the approximately 1,000 General Conference-elected delegates are clergy, and half are lay people. 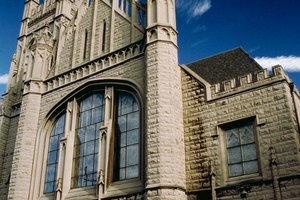 Bishops attend the conference but cannot vote; while they have a strong leadership role within the church, their ability to make decisions is limited by the church's system of checks and balances. Both men and women serve as clergy and bishops. The pope is the head of the Catholic Church, which teaches he "stands in Christ's place, on Christ's behalf, to shepherd Christ's flock." The College of Bishops is next in authority; individual bishops lead the different geographical areas known as dioceses. Some bishops are elected to the College of Cardinals. The cardinals advise the pope and elect a new pope when the former one dies or retires. 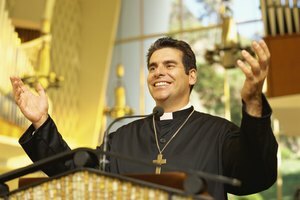 In the Catholic Church, only men are allowed to be priests, bishops or pope. Mulroney, Janet. "Difference Between Catholic & Methodist Beliefs." Synonym, https://classroom.synonym.com/difference-between-catholic-methodist-beliefs-5501.html. Accessed 25 April 2019.